One of the cutest couples in Hollywood just announced that they're expecting in the most adorable way possible. 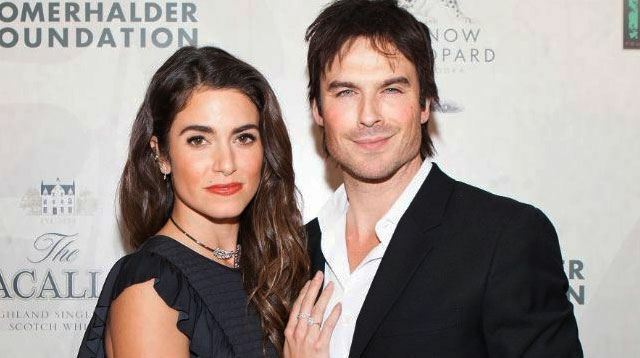 Taking to Instagram on Thursday, both Nikki Reed and Ian Somerhalder shared the news that they're expecting their first child together with a sweet photograph featuring the Vampire Diaries star kissing his wife's stomach. "To our friends, family, and rest of the world," Ian wrote. "In my 38 years on this earth I've never experienced anything more powerful and beautiful than this. I can't think of anything more exciting than this next chapter and we wanted you to hear this from us first." "This has been the most special time of our lives and we wanted to keep it between the three of us for as long as possible so we could enjoy this time with each other and our little one who is growing so fast...because that's what they do, they grow so fast," he continued. "Thank you for your kind energy. Love, Ian." Nikki also shared the same snap to her Instagram, adding an adorable little note to their child. "Hi Little One," she wrote. "I know you, but only because I feel you. How is it possible to love someone so much already? All I know for sure is it's the strongest feeling I've ever felt. We've been sharing this body for quite some time, and we've already experienced so much together. We can't wait to meet you… Love, Your parents." Someone pass the tissues, because my heart can't handle it. Congratulations to the adorable pair, who just celebrated their two year wedding anniversary last month.